And Edinburgh is a funky town and Pete has come to Edinburgh for the first time from Australia and we’re hoping to see him again. He’s played all over the place and we’re glad he’s turned up to singe the Fring with just an acoustic guitar and that my friends is no mean feat to pull off. 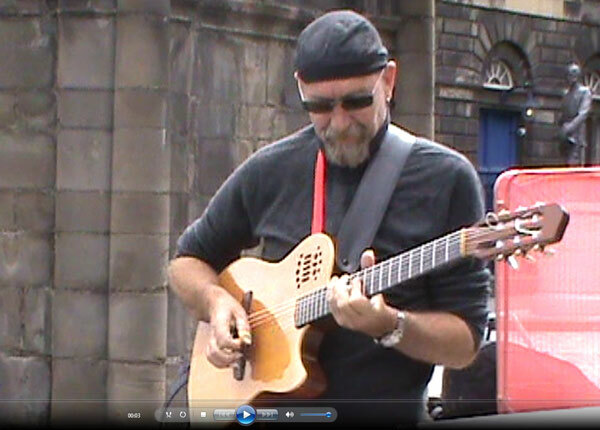 He’s a great guy and if you see him at the Fringe be sure to stop and hear him play it’s well worth it and you’ll not mind if you pull out a fiver too throw in his case. We had do make a dash for some work so our time at the Fringe was cut short but it was by no means a short measure. It did mean we couldn’t do one O’clock so we are looking to be a bit more flexible with our time and this is the way of a new project. Today we are going to catch some of the night life at the fringe so check out tomorrow’s video to see what happens. It’s a preview of his act and an interview when we managed to catch up with Pete after his gig. Hope you enjoy everyone.